Our 2018 Expedition saw 100% success on both Everest and Lhotse with guide Ben Jones, Eric Murphy and Jangbu Sherpa leading the team. Also noteworthy was Sherpa guide Kami Rita Sherpa with his record breaking 22nd ascent! The most notable detail was team patience as we waited for the perfect weather window. Ultimately, we were able to summit in beautiful weather with very few climbers on the mountain. Also, guide Jangbu Sherpa led one of the climbers to the summit of Lhotse following the Everest summit for another successful traverse. We encourage you to chat with last year’s climbing team! And we also offer a Camp II climb. Scheduled lead guide for 2019: Ben Jones along with Jangbu Sherpa and Eric Murphy. 2018 saw 100% success on Everest and Lhotse, while our 2017 expedition had 11 members reach the summit, and another Everest-Lhotse traverse. Our 2016 Everest Team had 100% summit success! Our 2019 team will be led by Alpine Ascents’ Everest guide Ben Jones along with Jangbu Sherpa and Eric Murphy. As always, we will employ our famed Sherpa staff. Our Sherpa team is legendary throughout the climbing community and will be the mainstay of our summit support team. The Sherpa team, organized by Lakpa Rita Sherpa, will set the route and manage a quality Base Camp, which is renowned throughout the great tent city at the foot of the mountain. We look to bestow our traditions and expertise on every climber. Similar to past years, we are committed to high-quality logistics, using low ratio guiding with professional mountain guides, and leading small groups of climbers supported by a strong Sherpa team. Research shows that the Alpine Ascents’ guiding style has a much higher success rate (as much as 50% higher), than less supported climbing teams. Mt. Everest, rising 8,850 m (29,035 ft.) above sea level reigns as the highest mountain on Earth. Since the first ascent in 1953 by Edmund Hillary and Tenzing Norgay, reaching the summit of Everest has been considered one of the greatest achievements in mountaineering. Every spring, Alpine Ascents International embraces this challenge, taking a group of qualified climbers to climb Mt. Everest via the South Col route in Nepal. prepared meals by western trained chefs allow you to relax and regain strength when returning from your acclimation climbs. On the mountain, our guides and Sherpa are focused on your welfare and safety. Our philosophy is that by working together as a team we will climb safer and have more climbers reach the summit. Through leadership and excellent climber care, this has proven true year after year, giving us the highest success rate on the mountain and an excellent safety record. Alpine Ascents has always been on the cutting edge of innovations in guiding. In 1991, we co-founded the Russian company, Poisk, and designed the Poisk Oxygen Cylinder, which is still the lightest and most efficient bottle used on the mountain today. In 1992, we led the first successful guided expedition to Everest along with Rob Hall’s team. That year we also introduced the idea of (and helped facilitate) bringing Russian Mi-17 helicopters to Nepal to provide more reliable expedition transportation to the mountain. Alpine Ascents pioneered the idea of a 24-hour Everest and Lhotse summit climb, and in 2012, we led the first guided expedition up Everest and Lhotse, putting three climbers on top of two 8,000 m peaks in under 24 hours. This had never been achieved before, guided or otherwise. We are proud to look back at the many years of achieving these goals and supporting over 280 climbers in stepping foot on the summit of Mt. Everest. Looking forward to 2018, we plan to continue our well-maintained expeditions with extremely experienced climbing guides, Sherpa with years of climbing expertise and unparalleled Base Camp and ground support. For more information on the climb, go to our Why Climb With Us section. Climbing with Alpine Ascents was the best decision I made, and I could not have been more pleased. You may pay more than some of the other companies, but I think you get more. The client-to-guide ratio was low, so there was always someone covering your backside. The experience level of the guides and the Sherpa team was very high, with many Everest summits between them. The tents, food, equipment, and technology were top-notch, as well as the relay of information that was passed along to friends and family back home. Most of us only have one shot at Everest. Why not give it the best shot that you can? We have learned that many logistical factors also effect the safety and success of an Everest expediton. We are looking for experienced climbers for whom Everest is the next logical step in their climbing careers. Our team will be in top physical condition and ready to meet the extreme challenges Everest presents. It is important that your resume includes previous high-altitude climbs and strong mountaineering skills. Climbs like Denali, Aconcagua, Cho Oyu and Vinson are good prerequisites for attempting Everest. It is important that a team member be able to work well with others and be willing to commit to a group effort that will last for several weeks. This team effort has proved to increase summit success and make for a more enjoyable climb. Mount Everest, rising 8,850 m (29,035 ft.) above sea level, reigns as the highest mountain on Earth. Since the first ascent in 1953 by Edmund Hillary and Tenzing Norgay, reaching the summit of Everest has been considered one of the greatest achievements in mountaineering. Every spring, Alpine Ascents International embraces this challenge, taking a group of qualified climbers to climb Mt. Everest via the South Col route in Nepal. With over 20 years of guiding experience on Everest, Alpine Ascents is in an elite category in our ability to present qualified climbers with a truly rewarding experience on Everest. As you read through our Everest web pages, you will find a wealth of information, rationale for decisions, and why, after two decades, we stand behind the Alpine Ascents method more than ever. We can summarize by stating quality, safety, and summit success are our three primary goals each and every time we launch an Everest expedition. Alpine Ascents pioneered guiding on Everest 20 years ago and today we remain the leader in offering high quality expeditions. An ascent to Camp II is a unique opportunity to experience climbing through the Khumbu Icefall and the Western CWM to our Advanced Base Camp at the base of the Southwest Face of Everest (21,500 ft.). One must have strong skills and be in very good physical condition to take on our Camp II expedition. 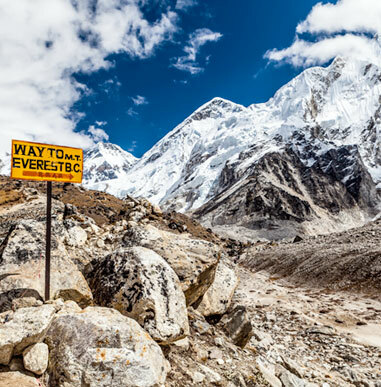 Team members experience climbing through some very challenging and notable aspects of Everest, and get first-hand experience of what it takes to climb this great peak, as you are traveling much of the same route as our Everest summit team. This is an excellent opportunity to see if a future Everest climb is right for you or simply a chance to climb part of this legendary peak. As always, Alpine Ascent teams will be led by veteran Everest guides and our legendary Sherpa climbing staff who will provide the foremost in logistics and Base Camp facilities. Our unique team approach to climbing the mountain has allowed us to continually operate successful expeditions while maintaining an excellent safety record. Climbing Skill Level: Climbers prepared to take on Everest Camp II should have completed at least a week-long training course and have completed a climb of a glaciated peak. We will review each climber’s bio on an individual basis to help develop climbers interested in attempting Everest Camp II. Over the last several years, a number of our climbers, when using our maximum oxygen flow system, have demonstrated the desire and strength to continue directly to Lhotse for a summit climb after summiting Everest. This approach to climbing Everest and Lhotse in the same season allows you to climb two 8,000-meter peaks (the highest and fourth-highest mountains in the world) in as little as 24 hours, summit to summit. While it’s no easy feat, our acclimatization program – combined with our rest day at South Col, max oxygen usage, and expert team of guides and Sherpa – make this a real possibility for our climbing members. In 2011, we set a historical precedent with our Everest-Lhotse climb – the first three climbers to summit two 8,000 m peaks in less than 24 hours, the first guided climber to do so, and the first guide to accomplish the feat. In 2013, two guides, three climbers, and two Sherpa repeated the achievement! Join us as we attempt to make history again. We climb Everest first, using our maximum oxygen supply (four-liter flow per minute). In good conditions, we are back at the South Col between noon and 2 p.m. From here we have a variety of choices, depending on weather and strength of climbers. We can rest for a few hours at the South Col, then do the two-hour traverse to our Lhotse High Camp. Or we can spend another night at the South Col, and move to Lhotse High Camp the next day and summit the following day. This is an amazing opportunity for the motivated climber to summit both these peaks with the best support available. No other company offers the expertise, logistical support, and years of experience that Alpine Ascents provides. Our veteran Himalayan guides are with you at all times, along with the strength and support of the best Sherpa team on the mountain. Our rest day on the South Col (on oxygen) allows you to recuperate before the summit attempt, and the max four-liter-per-minute oxygen flow gives you a much better chance of a fast and strong climb on the mountain. Alpine Ascents has been guiding Everest for 27 years. Over this time we have fine-tuned our program by addressing important factors that affect the safety, success, and the overall experience for the individual climber and the entire team. We also continue to incorporate new technology and evolving climbing methods as they develop. Below we discuss some of the most important aspects of our program and explain the differences between AAI and other companies. We start with a strong group consisting of a maximum of 12 qualified climbers with two to four mountain guides, depending on the group size. Our average team size is usually between eight and ten climbers. We add our team of 14 to 18 well-trained and experienced climbing Sherpa, and four to five camp staff. Our Sherpa team is the strongest on the mountain; most have summited Everest between 5 and 20 times and have worked exclusively with us for many years. How far is it to the summit? Can I make it back by nightfall? Do I have enough oxygen to make the round trip safely? Is the weather deteriorating to a point when I should turn around? Am I moving fast enough? Other real concerns such as regulator failure, loss of equipment, or becoming physically weak and cold are almost impossible to deal with safely on your own. A strong team carrying extra regulators, hot liquids, and gear will increase your safety and success. Climbing on a team with only one guide has its difficulties as well. Guides are not immune to illness, and if the guide becomes ill or weak, it jeopardizes the entire climb. It is also difficult for one guide to manage a group. We believe that having two or more guides making good decisions together gives you the backup you need for a safe climb. There are many advantages to climbing with a team and they can be measured directly in two ways — success rate and safety record. Our rate of success over the last 10 years (excluding 2014 and 2015 when no one climbed the mountain) is 80%. This means, of the people who sign up for the climb, 80% have reached the summit. When you compare these numbers to other operators and more specifically, Sherpa-only supported climbs, their success rate is 50% and below. We believe that this low success rate is attributed to client care and management, especially high on the mountain. Alpine Ascents has never had a client seriously injured (or worse) on Everest. As with any adventure, there are no guarantees, and we feel fortunate. Accidents can happen at any time and for many reasons beyond our control. We take risk management very seriously and it is our number one priority at Alpine Ascents. We think it is important to know the facts. We have looked at historical data of the number of foreign climbers who perished on Mt. Everest starting in 2004 (when non-guided attempts on Everest became more prevalent) through the 2016 season. We have excluded 2014 and 2015 when the mountain was shut down early. During this period, 54 foreign climbers died on Everest. We looked at the location and cause of each. Five were unknown locations, and 41 out of the 49 remaining were between High Camp and the summit. This means 84% of all known foreign climber deaths were associated with the final days of a summit attempt. The information also shows, overwhelmingly, that these deaths were caused by a combination of exhaustion, poor judgment, and lack of support. These risk factors can be considerably reduced by climbing with an experienced team. Alpine Ascents provides more oxygen than any other company. We also add special logistical support, for example starting oxygen from Camp II during summit attempt and taking a rest day on oxygen at the South Col, allowing climbers to rest and regroup for the challenges of summit day. No other company offers these services, and all climbers say it makes the difference. Overall, Alpine Ascents is a full-service company with your best interest at heart. We want to provide you a safe opportunity to climb the mountain with the greatest chance for success and enjoyment. Our approach to acclimatization on Everest has resulted in our proven expedition itinerary. Proper acclimatization is the most critical factor in a successful trip and you will receive daily lectures and reviews from our guides throughout the trek and climb. During the trek to Base Camp, our goal is to stay healthy and make sure all climbers are acclimatizing well. We are not on a set schedule and will take extra days anywhere along the trek to further acclimatize, if necessary. It is extremely important that when you reach Base Camp you are feeling good and are comfortable with the thin air at 17,500 ft. (5,334 m). After moving into your new home at Everest Base Camp, we spend four to six days acclimatizing while training in the safe areas of the lower Khumbu Glacier. We will practice ladder crossings, fixed-line travel, rappelling, and crampon work, which prepares us for climbing on the mountain. During training, we make a foray partway up the Khumbu route before heading to Camp I (19,590 ft./5,971 m). On our first rotation up the mountain we climb to Camp I and spend the night. The next day we take a short walk towards Camp II (21,300 ft./6,492 m) and back to Camp I for a second night of sleep. Day 3 we climb up to Camp II and spend two to three days acclimatizing in the area before returning to Base Camp. We will take another rest period of four to seven days at Base Camp. When the entire team is ready, we’ll head back to Camp I, and the following day up to Camp II. We will take a rest day here and if the weather is good, we’ll climb up to Camp III (23,500 ft./7,162 m) the following day. The guides will make a decision whether or not to spend the night at Camp III based on weather and other factors. After returning from Camp III to Camp II, we rest for the night and descend to Base Camp the next day. After this rotation we have the option to head down valley for a rest period to breathe thick air, eat large amounts of food, and enjoy the sunshine and warm weather for several days. This has proven to be extremely beneficial in preparing climbers for the summit attempt. While down valley we monitor weather and activity on the mountain via radio. When all is good we head back up to Base Camp and prepare for our summit attempt. With a good weather report, we will climb to Camp II and rest the next day. If the weather is still stable, we’ll put on our oxygen gear and climb up to Camp III, and the following day to High Camp at the South Col (26,000 ft./7,924 m). We rest the entire next day on oxygen after reaching High Camp and leave for the summit late that evening. Around 8 or 9 p.m. we wake you up and begin getting everyone dressed and ready for the summit attempt. We leave between 11 p.m. and midnight. You will have guides and Sherpa assisting you the entire day. You will be climbing on full flow oxygen, which is four liters per minute, and you will have a personal Sherpa carrying extra oxygen for you. Usually we reach the summit between 8 a.m. and 9a.m. We take photos, enjoy the view, and celebrate our success before heading down. Usual time to descend is three to four hours back to the South Col. Those climbing Lhotse will leave that evening at midnight to climb Lhotse and descend to Camp II. Others will leave later that morning and descend direct to Camp II. The following day we all descend to Base Camp. 2013 proved to be a great season for us with 100% success of climbers who reached High Camp making the summit, and over 80% of the climbers who joined our climb reaching the summit. We were also thrilled to have two guides, three climbers, and two Sherpa reach the summit of Lhotse (both peaks reached within a 24-hour period). These percentages are very high when compared to other outfitters and we certainly encourage you to compare these statistics (using the same reference points) to other outfitters. Overall totals include 39 climbers on two teams (13 Climbers, 6 Guides, 20 Sherpa). 2012 was another banner year for Alpine Ascents. Though a difficult season with tough summit conditions, Alpine Ascents was one of the few groups to have large-scale summit success. We attribute much of the success to our experience, which enabled us to choose a difficult but uncrowded summit day and utilize the expertise of our guides and Sherpa. 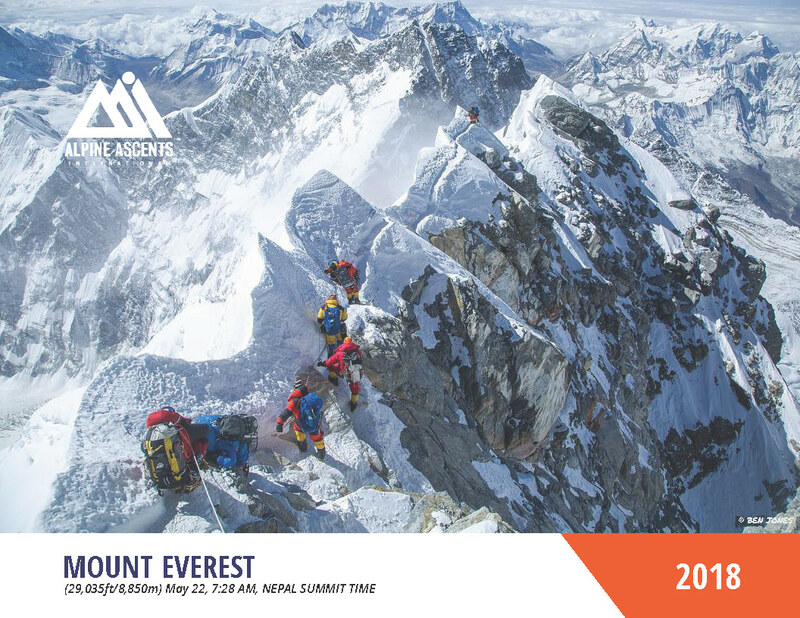 By the numbers, Everest 2012 saw 14 climbers reaching the summit. 2011: Alpine Ascents is proud to have 100% success for all those who joined our expedition, with a number of climbers reaching Lhotse shortly thereafter. This was the first time climbers reached the summit of two 8,000 m peaks in 24 hours. Everest 2010 had 100% success for those who reached High Camp with similar success to years past. We are happy to provide details of 20+ years of expeditions. 2017 saw 11 climbers reach the summit! See our Cybercast for details. 2016 met with 100% summit success! The 2014 and 2015 seasons were cancelled due to the natural disasters. We have been working directly with the local community and other organizations in the aftermath to help ensure that we meet the needs of all climbers and guides. For those that wish to learn more about our efforts and the Alpine Ascents Foundation, read more. As in the past, Alpine Ascents will offer a fully supported expedition. We do not offer Sherpa-only guided, hybrid, guide-at-base-camp-in-radio-contact, or inappropriate climber-to-guide ratio as this is simply not our style. We feel this limited support approach strays from the goals of providing the best and safest chance of climbers reaching the summit. Our 2018 team will be led by Alpine Ascents staff guides. As always, we will employ our famed Sherpa staff. Our Sherpa team is legendary throughout the climbing community and will be the mainstay of our summit support team. The Sherpa team will set the route and manage a quality Base Camp, which is renowned throughout the great tent city at the foot of the mountain. We look to bestow our traditions and expertise on every climber. These are the primary mountains in the world exceeding 8,000 Meters in height. Some of them have subsidiary peaks that are also 8,000m. The South Col route on Mt. Everest’s south, or Nepalese, side was first explored in 1950 by a British expedition led by Eric Shipton. Prior to that time, climbers could see the Khumbu Icefall from a high glaciated pass, which was easily accessed from the north, or Tibetan, side of Mt. Everest. It was universally considered impossible to climb by those few who had looked upon it from this high vantage point. Then, with the Chinese invasion and take-over of Tibet, geopolitics changed and the world’s highest peak was no longer accessible from Tibet. Thus, for the first time, Nepal allowed access to foreigners. In 1950 the previously unthinkable happened and the Khumbu Icefall was first climbed and deemed doable, but dangerous. What exactly is an icefall? For nonclimbers, a glacier can be likened to a very slow-moving river, one which is simply frozen. When a river increases its gradient, it turns into a very broken up rapid or cascade. When a glacier increases in gradient, it turns into an “icefall.” This icefall, especially the Khumbu Icefall, is an amazingly chaotic jumble of ice blocks of all sizes. It is a place of otherworldly beautiful and improbable shapes, forms, and shades of green and blue. It is a place of eerie silence and improbable heat, as well as cold. It is also a place of continual movement. Often this movement is not perceptible, as the entire mass is moving. At other times the movement is sudden, brutal, and has incredibly destructive consequences to everything below, as figuratively hundreds of tons of ice blocks can give way all at once. When this happens (often several times per day in one place or another within the icefall) everything below is reduced to nothing more than a fine white ice powder blown away by the mountain winds. The trick as a climber is to not be in that spot . . .
As climbing Mt. Everest became more popular in the 1970’s, and consequently more expeditions were on the mountain at the same time, expeditions began to cooperate with the “fixing” of the route through the Khumbu Icefall. This “fixing” means a continuous length of interconnected ropes — thousands of feet of ropes — for safety. This allows a climber to always be connected to ropes, which are, in turn, connected to various anchors placed into the snow or ice. This is a safeguard against falling and injury, and at the same time allows a climber to quickly move independently away from danger — something which is much more difficult and slower if one is instead roped directly to other climbers. Along with these ropes, the terrain often requires artificial structures to bridge otherwise uncrossable ice walls or large cracks called crevasses. Most often, these artificial structures are combinations of aluminum ladder sections tied together and stabilized by a latticework of other ropes. Very impressive to behold, and often very scary to traverse! By the 1990’s, with even more climbing action taking place, there were complaints that many of the participating expeditions, either lacking funds or desire, were not contributing to the group fixing of the route. They were instead using other expeditions’ hard work while contributing nothing. Therefore, in the past few years a Nepalese governmental agency has stepped in to ensure that all contribute fairly based upon the size of the expedition. The Sagarmatha Pollution Control Committee now oversees this. They are primarily concerned with policing expeditions and groups to control garbage properly, and so they subcontract with other people to do the actual work of fixing the route. During the Alpine Ascents 2000 expedition to Mt. Everest, this work was carried out very well and ongoing maintenance to the icefall route was done promptly. A group, run by a British individual, was awarded the contract for the spring 2002 season, and the maintenance effort was very short on supplies, manpower, tools, and perhaps experience to properly do their job. This created some dangerous conditions for climbers traversing the icefall, and most expeditions season drafted letters to the SPCC lodging their complaints regarding the situation. There was some discussion regarding the next season. Many regulars refused to pay the SPCC and simply wanted to go back to the old cooperative way of doing things. The route farther up the mountain is also prepared, or fixed, with lines in places for safety, but this work is done by separate expedition Sherpa staff in cooperation with each other. All expeditions share the same goals of summiting and doing so safely, so it makes a great deal of sense to cooperate with each other and share in the work of preparing the route with this in mind. All expedition leaders and Sirdar (a Sirdar is the chief of Sherpa staff for an expedition) meet and decide upon a work and materials schedule so that all of the expeditions can share in this preparation work on the upper mountain. This has generally worked quite well, and the route becomes fixed via a cooperative effort amongst expeditions such as Alpine Ascents, Adventure Consultants, International Mountain Guides, National Geographic, and other expedition companies. From Camp I, just above the Khumbu Icefall, the route enters the Western Cwm, which is a very large and steep valley, partly filled with the upper Khumbu Glacier. This “valley of silence” was first traversed by the Swiss expedition of 1952, who in fact pioneered most of the route on the upper mountain and came very close to the summit the year before the British success in 1953. It is a hauntingly beautiful place, but not without its dangers also. While it is often a place of silence, it also occasionally thunders with rockfall raking the steep faces of Mt. Everest to one side and Nuptse to the other side. Just as frequently, ice or snow avalanches roar down for thousands of feet to the glacier. Climbers can quite easily avoid avalanches simply by staying away from the sides of the valley. The numerous and deep glacier fissures, called crevasses, are less avoidable hazards. These crevasses are caused by the stress of glacier movement. Take a warm Snicker’s candy bar and bend it in the middle and note the “crevasses” formed on the surface, and you get the idea. Many of these crevasses are bridged over by snow and not visible to a climber on the glacier’s surface. These hidden crevasses can constitute a serious threat, especially after times of fresh snowfall, and climbers usually prepare by roping up to other climbers — with adequate rope between — so that the climber skill known as “self-arrest” will stop a fall into a crevasse should someone break through one of these snow bridges. Near the end of this gently sloping valley, lies Camp II, and the Lhotse Face looms above. Camp 2 at over 21,000 ft./6,400 m, is the staging camp for starting up the face formed by the western side of neighbor mountain Lhotse. This face constitutes a serious challenge, as expeditions must climb over 3,000 ft./1,000 m of 35–45+ degree ice. Camp III is perched in the middle of this awesomely steep and long face. So here too, thousands of feet of fixed ropes are placed for the safety of climbers to safeguard against falling. The last stop on the way to the summit is Camp IV, or High Camp, at the pass between Lhotse and Everest known as the South Col. To arrive at this camp requires traversing much steep ground, and climbers must overcome such features as the Yellow Band (a steep, golden sandstone cliff that splits part of the upper Lhotse Face), and the Geneva Spur (an enormous buttress or ridge-like feature of rock that must be climbed) with the safety of fixed ropes. Many early expeditions here used seven or eight camps instead of the currently accepted four camps. This big reason for this change, has been the huge increase in skill and ability of the high-altitude Sherpa hired by most expeditions to assist. Originally, in the 1950s, the Sherpa looked to foreign climbers for training, as most Sherpa were not skilled in climbing techniques. Their main assets were their strong work ethic and their genetic adaptation to altitude. Nowadays, Sherpas still have their genetic adaptation to altitude and their strong work ethic, but they are often also much more skilled climbers than the foreign climbers who hire them to help. This means it is much easier and faster for them to go up and down the mountain to prepare and stock camps than in earlier times, and so fewer camps are needed. I must also stress here that I do not believe many climbing expeditions give their Sherpa staff enough credit for the success of an expedition. Without the hard work of Sherpas and their high skill levels, there wouldn’t be 10% of the current numbers of successful Everest summiters. Everyone has perhaps heard of “Hillary” backpacks, but has anyone ever seen a Chewang sleeping bag? Chewang has summited nine times on 12 different Mt. Everest expeditions. Why isn’t he famous in America or Europe? Or how about Apa who has summited 13 times? Above High Camp still lies much steep ground before the summit at 29,035 ft./8,850 m. Such features as the Triangular Face, The Balcony, the Southeast Ridge, the South Summit, the Traverse, and the Hillary Step all guard the world’s “third pole” well and ensure that a climber will work for his or her reward and need a minimum level of hard-earned skills to get there. A sufficient level of safety and security can be maintained in this hostile territory only through the judicious use of fixed ropes, individual skills, and a high level of teamwork on both Sherpas and foreign climbers’ parts. The exercise of good judgment is also vitally important. “Never give up” and “just do it” can and have proven fatal many times on the world’s highest mountain, and perhaps a “those who climb and run away live to climb another day” is a more appropriate attitude for climbers who dare to challenge themselves on the slopes of Chomolungma in an environment more suited to jet airliners. Often inseparable from mountaineering, the Sherpas of Nepal inhabit much of the lower portion of the Himalayas known as the Solu-Khumbu or “Khumbu.” While their reputation as climbers is nothing short of historic, local Buddhist, animist, and cultural traditions have equally nurtured and impacted a fascinating relationship with westerners and western thought. Sherpas became prominent to the West when British mountaineers began to set their sites on conquering Himalayan peaks. With the first Mt. Everest expedition in 1921, the skill, expertise, honesty, and dedication of Sherpas as guides and partners became an integral part of Himalayan climbing. The affinity of outsiders for Sherpa/Buddhist civilization has blossomed into an ever-increasing sharing, understanding, and friendship between cultures. Sherpas traditionally worked as traders, farmers, and religious folk. Along with these ancestral roles, leading climbs and treks has recently become a mainstay of the Sherpa economy. Sherpa refers both to a tribal group and a job capacity as porter, climber, or trek leader. The term “Sherpa” means easterner, referring to their origins in Eastern Tibet. The migrations of this Tibetan culture began sometime in the early 1400’s. Today the Sherpa population in the Khumbu is about 5,000, with a total of roughly 35,000 living in Nepal. The first notable and successful Everest climbing Sherpa was Tenzing Norgay. In 1952, Norgay accompanied Raymond Lambert to within 800 vertical feet of the still unclimbed Mt. Everest. A year later Norgay was asked to join the British team led by Col. John Hunt that successfully summited Everest, following the same route as Norgay and Lambert. Norgay and Sir Edmund Hillary were the first climbers to reach the summit. By the mid 1980’s, Sherpas had summitted Everest many more times than westerners. Ang Rita Sherpa, the most well known climbing Sherpa, had amassed seven summits of Everest by 1995. In 1993 Pasang Lhamu Sherpa became the first Sherpa woman to summit Everest. 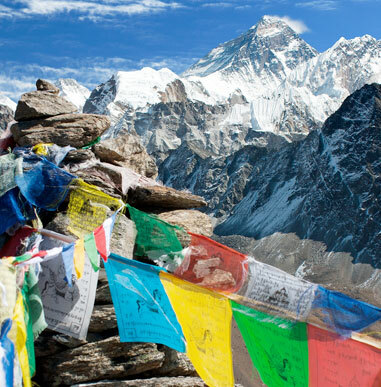 The name Khumbu comes from its guardian deity, Khumbila Tetsan Gelbu. The literal translation is “Khumbu country god.” The teachings of Sherpa Buddhism talk of a spiritual understanding between all beings. This is probably why the level of hospitality and acceptance of westerners comes naturally to the Sherpa. It should, however be mentioned, that Tibetans are also considered fierce warriors. Peter Potterfield, W.W. Norton pub. by Maria Coffey, Harbour Pub Co.
Below please find some additional information that may be helpful. The most relevant information can be found on our Everest web pages and, upon registration, each climber receives a detailed Climber Information Package. Climbers should have a well-proven track record of high-altitude climbs, Denali, Cho Oyu, or 8,000 m peaks are most relevant. Most climbers begin with our mountaineering school and then climb more challenging peaks, taking on greater altitude. 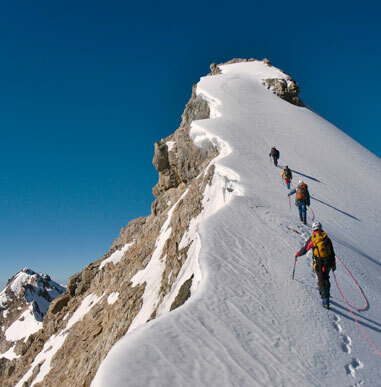 Training courses and climbs on Rainier, Ecuador Volcanoes, and Denali are the most common path. We are happy to email our “From Mountaineering School to Everest” brief and work with you individually. Climbers must be in excellent physical condition. This is a long expedition requiring patience, stamina, mental fortitude, and strong willpower. Summit day can be 20 hours long. Any tips on how climbers can maximize their chances of success? Along with the required climbing skills, review cardio training on the Everest Training page. We strongly recommend following the advice of our guides to acclimatize properly. Your expedition leader will be one of our professional mountain guides. We are well known for our expert guides and climber-to-guide ratio and invite you to read our Why Climb Everest With Us page. The best time to climb Everest is in the Spring, April–May. During the trek we will be lodging in teahouses. Climbers will either share a teahouse room or may have a private room. In Base Camp, each climber will have their own tent. Above Base Camp, in camps I–IV, climbers will share tents. During the trek, team members will only carry gear and supplies for the day. At no point do we carry overnight camping gear or equipment during the trek. Daypacks will weigh no more than 20 lbs. Above Base Camp on the climb we will typically carry packs that weigh 20–30 lbs. While all items are required, there may be times when some of the items on the Gear List may not be used (such as warm weather or changing conditions). The Gear Lists are created by the guides to assist in having climbers be prepared to summit in any conditions. We look to work with each climber individually. While it is impossible for us to list all brands for certain gear, we do offer a wide variety of equipment in our Gear Shop that has been handpicked by our staff of mountaineering experts. Please feel free to call our offices with any gear questions or substitutes. Plastic boots are required for this climb. During the trek we will provide unlimited amounts of boiled and purified water at mealtimes. Each climber is asked to bring a Steri-PEN to treat water. Team members can fill up water bottles at meals. Climbers can purchase bottled water in teahouses at additional cost. Water that can be treated is nearly ever-present along the trekking route. At Base Camp and on the route, water will be boiled. We also provide a good variety of hot drinks throughout the trek to Base Camp. We prefer that the number of bottles purchased during the expedition be kept to a minimum. Meals in the mountains consist of a diet rich in carbohydrates because our bodies do not process fat and protein efficiently at higher elevations and to compensate for the increase in caloric need that high-altitude climbing involves. We try to make meals varied and as normal as possible. During the trek we will be served meals in the teahouses that are prepared by our own staff. Meals during the trek and climb are made from food purchased both in Nepal and the US. Typical meals are rice, pasta, or potato dishes along with vegetable and egg dishes. Above Base Camp, climbing food mainly consists of dried meals such as pastas or rice. Lunches while climbing will mainly be made up of bars and snacks brought from the US. We are well known for our “fine dining” at Base Camp. You may bring your favorite climbing snack food such as power bars, Gu, Power Gel, cereal bars, or similar high-energy foods; powder Gatorade is also recommended to fight dehydration. Alpine Ascents provides all meals on this expedition. No requirements at this time but see your Climber Information Package. Fares are generally less expensive when booked early. You may use our travel agent (Charles Mulvehill 1-800-727-2157) or book flights yourself. Please note that flights booked online are often difficult to change. Please send us a copy of your flight schedule as early as possible as this allows us to book pickups and hotels. An Alpine Ascents representative will meet those climbers who arrive on the scheduled date (or those who have made prior arrangements) at the airport (look for the sign) and take them to the Yak and Yeti Hotel. Although it is likely that you will meet your team leader at the airport and other members during the day, we will have a scheduled meeting that day. This meeting will include introductions, final review, and an overview of the itinerary and trek. We are happy to make arrangements such as personalized tours, extra hotels rooms, airport pickups, and arrange for private rooms. In Kathmandu, telephones and internet access are readily available. Our guides will carry satellite phones in the mountains. The quality of the reception varies from location to location. Our Everest expedition generally has email access as well. A full Climber Information Package regarding communications will be sent to you once you join this expedition, as we plan to have phone and email and internet access on the mountain. In 2013 all tents had Wi-Fi access. Check the Reading List on the Everest page of the website. You can always call our offices and we will have one of your Everest guides contact you. Thirty days prior to departure, we will mail a list of the other team members to you. Long a tradition in mountaineering, these guidelines are based on your preference, level of service, and personal budget. Please contact us if you would like recommendations for lead guide tips and Base Camp manager tips. Each climber should submit an application and flight information among other forms specific to this expedition. Your Climber Information Package will detail all of the required paperwork. We accept MasterCard, Visa, American Express, personal checks, and Alpine Ascents gift certificates. To reserve a space, the deposit is $20,000.00 and balances are due 120 days prior to departure. Unpaid balances can result in forfeiture of trip. Everest Team 2017 from Ben M Jones on Vimeo. Everest 2017 Intro from Ben M Jones on Vimeo. Namche, Coffee, Hike, and rest from Ben M Jones on Vimeo. Everest Basecamp Tour from Ben M Jones on Vimeo. Ladders of the Khumbu from Ben M Jones on Vimeo. Camp 2 Tour from Ben M Jones on Vimeo.